Let’s face it just who doesn't enjoy blowing stuff up? Not in a dangerous sense by all means but just jamming out to some rock music while you feel a sense of adrenaline with just a pinch of aggression (but not too much though calm down). 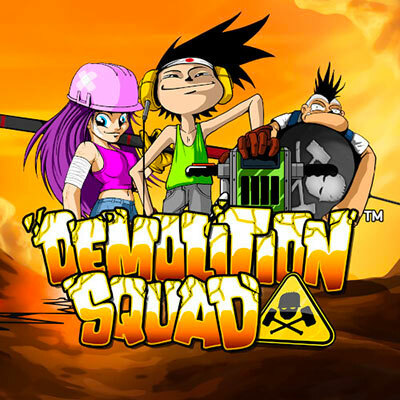 Demolition Squad is the online slot from NetEnt that uses a head banging rock-n-roll soundtrack with a sketchy cartoon-style art that energises not only its animations but the player who is sitting at the other end of the chaos with his hands out hoping for some rather explosive cash prizes. NetEnt (short for Net Entertainment) are known not only for their highly anticipated online slots and games, but also for their pioneering attitude towards the industry itself. You may know them from cutting edge titles such as Blood Suckers and Bob the Epic Viking Quest. Demolition Squad is a 5 reel, 4 row slot with 40 fixed pay-lines which offer many different chances at victory. Expect a lot of the usual suspects such as scatters (which will trigger free spins), wilds and a rather nifty ‘Demolition Wild’ feature that will provide even more mayhem for those who just love making a mess without the cleaning up. Demolition Squad is compatible with Mac, Linux and Windows making it very multicultural. The design of Demolition Squad draws heavily on a jungle like base. Around in the background you will be able to spot a wide array of vehicles and tools there strictly to help assist you in the destruction of the reels. Like most slots you’ll have your standard symbols as well as lower value symbols to keep the ball rolling. Five lower value symbols appear as 10, J, Q, K, and A’s across the board. In total there are six higher-value symbols, with each offering a different score depending on how many are included in a winning combination. The highest value symbol happens to be a white robot who stands in-front of a red background. Fee spin modes will grant even higher pay-outs depending on what lies in your path. These are triggered through scatter symbols and will grant players more chances to go hard in the paint and win big. It’s not very often that a game that is built on destruction can lead to such rewards, you must play as someone who can pull a lot of strings because otherwise you might end up sacked. It’s not often that we are quite literally blown away by an online slot, but thanks to Demolition Squad we are at a loss of words. What NetEnt have managed to create is nothing short of phenomenal. Everything from gameplay to graphics, there isn't a singe space that doesn’t make us take a step back and say wow. If you enjoy immersive experiences with an explosive edge then you will definitely want to be playing Demolition Squad, it has all the right tools to make you a lot of money.